1986 LeBaron K body convertible. Originally a 2.2L TBI, I am installing the 2.2L T2 engine from my totaled 1985 Mark Cross convertible. 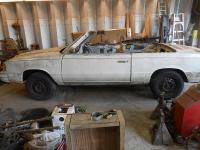 Get the floor replaced, finish wiring up, install interior and top. Get set of 203/60 R 15 tires and decide which mags look better, eggshells or windmills.